by Chris Woodford. Last updated: July 24, 2018. Did you sleep well last night? Maybe you're of the same mind as Benjamin Franklin, who famously said: "There will be sleeping enough in the grave." But if you're like most people and you believe the key to a good day's work is a good night's rest, the best place to start is with your bed. You're going to spend about 8 hours a night sleeping for your entire life—roughly 25–30 years of snoozing in all. With all that lying about doing nothing, doesn't it make sense to find the most comfortable bed you possibly can? Many people are switching from traditional, sprung beds to mattresses made of memory foam that mold exactly to your body shape. What is this stuff... and just what gives it its memory? Let's take a closer look and find out! Photo: Viscoelastic foam sinks in where you press it, so it molds exactly to your body shape. At first sight, it just looks like particularly thick and squashy foam, but there's much more to it than that. Ordinary foam springs straight back to shape, whereas viscoelastic foam takes much more time to return, which is why it's called "memory" or "slow recovery" foam. What's different about memory foam? 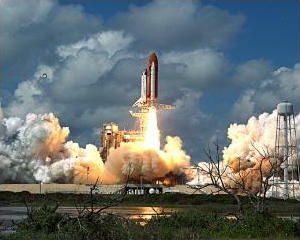 Photo: Blastoff: Are you sitting comfortably? Then we'll begin. The original memory foam was invented in the early 1970s by NASA scientists. Their mission? To develop a pressure-relieving material that would cushion astronauts in rocket cockpits against extreme forces during blastoff. The foam mattresses sold commercially are a much-improved version of NASA's technology. Speaking about its TEMPUR® products, the leading manufacturer, Tempur-Pedic, claims its scientists have spent millions of dollars and a full decade turning TEMPUR into a better material. Picture courtesy of NASA on the Commons. The trouble with sleeping is that your bones get in the way. Without bones, sleeping would be easy: if you were just a big blob of muscle and fat, imagine how comfortably you'd sleep! Unfortunately, though, all that body tissue is wrapped around a hard structure—your skeleton—that feels about as comfortable as the frame of a bicycle. A traditional bed has a mattress of soft material supported by several hundred coiled metal springs, coupled together so they move as one in what's called an open or continuous coil. The whole thing tends to cave in when you lie on it, but it won't respond exactly to your body shape. If you lie on your back, your buttocks will press further than the rest of your body leaving parts of your spine unsupported—potentially giving you backache the next day. If you lie on your side, your hips and shoulders will tend to press down more—supporting more than their fare share of your bodyweight and making you feel uncomfortable. If you're sleeping with a partner on a mattress like this, your bodies tend to create a valley in the middle and roll together. A more sophisticated spring mattress will use a different approach: there are at least twice as many springs (sometimes 10 times more) arranged in small pockets, and each one flexes individually. Different areas of the mattress may have more or fewer springs made from different gauge wire to give more or less support. Pocket-spring mattresses like these give much more support, but they're also heavier and more expensive because of all the extra springs. Better mattresses tend to have a higher "spring count." Artwork: Three common types of mattresses compared. 1) Open coil mattresses have fewer springs coupled together so the surface all tends to move together. That can leave parts of your body unsupported. 2) Pocket spring mattresses have more springs that flex individually, giving better support. 3) Memory foam mattresses work (in theory) like an infinite number of springs, flexing exactly to your body shape. The idea of memory foam is incredibly simple. Instead of sleeping on springs, you sleep on very thick foam that gives way where you press on it. Technically, it's called viscoelastic: visco (from viscous) means it moves, somewhat reluctantly, when you apply a force; elastic means it returns to its original shape when you remove the force. The foam is temperature sensitive, so it tends to sink more as your body temperature warms it up. Very quickly, it molds to your unique contours. If you sleep on your side, the foam sinks in much more at your shoulders and hips so—in theory—your entire body is always perfectly supported and your spine remains straight. Your weight is spread more evenly and the pressure is relieved on places like your shoulders and hips. That's why many people find memory foam mattresses help to reduce the symptoms of problems such as backpain and arthritis. If you change position or turn over, the mattress gradually molds to your new shape. When the sales person hovers over you in a bed shop, they might try bamboozling you with a bit of science. Memory foam is better because it's "viscoelastic," they tell you. It "was developed by NASA." But what exactly do they mean? Are these things helpful—or just a marketing con? Let's dig a bit deeper and find out. Viscous means a material is thick and runny—treacle, for example, or thick lubricating grease. The more viscous something is, the longer it takes to flow from one place to another. Water isn't very viscous (we say it has "low viscosity") so it flows quickly; honey is fairly viscous (it has high viscosity) so it flows slowly. Elastic means something will stretch or deform but return exactly to its original shape and size when you take away the stretching force. When we say things are made of "elastic," we mean they stretch easily and go back to shape again. There isn't really any such material as "elastic": what we really mean is rubber or a stretchy plastic of some kind. What, then, do we mean by viscoelastic? A viscoelastic material is both viscous (changes shape slowly) and elastic (it returns to its original shape). Briefly, it deforms and returns to shape very slowly. That, by itself, is just a crude description: viscoelasticity is actually more subtle and interesting than that. If you apply a constant force to a lump of memory foam of constant area (so the stress is constant), it keeps deforming very slowly over a long period of time (something known in materials science as creep). Viscoelastic materials also respond differently according to how you apply forces. They're stiffer (change shape more reluctantly) if you apply a force quickly than if you apply it slowly, which makes them very useful both for cushioning and absorbing impacts. There's also a significant lag between when you deform a viscoelastic material and when it returns to shape (a typical memory-foam mattress takes 5–10 seconds to flex back to shape when you get off it—much longer than, for example, a foam sponge). That can be very useful for cushioning things, because energy is effectively absorbed and dissipated during the time lag (a phenomenon known as hysteresis)—a bit like the way energy is lost to "rolling resistance" as a bicycle or car tire squashes and flexes as it turns around. You could say that it's hysteresis that puts the "memory" into memory foam. Photo: Viscoelastic means something is both viscous and elastic. These everyday substances are more or less viscous, but none of them are elastic. On the left, peanut butter has high viscosity; wood glue flows better so its viscosity is lower; liquid soap flows even more quickly, so that's next on our scale. On the right, water flows very easily so it has low viscosity. Viscoelastic memory foam is more viscous than peanut butter, so it would come somewhat to the left of this scale. Like all these substances it's viscous because it deforms when you apply a force; unlike any of these other substances, it returns to shape when you take that force away again. Creep: When you apply a constant force, they continue to stretch and deform very slowly. Relaxation: If you stretch or deform them, you'll find you gradually need to use less force to keep them stretched by the same amount. Force-dependent: Applying a force slowly causes them to stretch more than if you apply a force quickly. Hysteresis: There's a time lag between stretching and relaxing and you don't get all your energy back when the material returns to shape. Photo: Testing viscoelastic hysteresis: I took a lump of viscoelastic bed mattress in my left hand and a simple kitchen sponge (ordinary elastic foam) in my right. I squashed each one 10 times, allowed it to return to shape, and timed how long the process took. 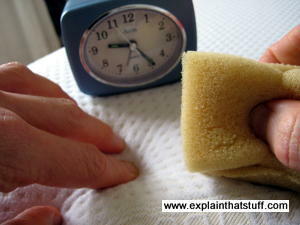 The ordinary sponge deformed and relaxed almost instantly, giving a total time of 6 seconds. The viscoelastic foam took about a minute to cycle through 10 deformations and relaxations because there's a significant lag (hysteresis) each time. It takes much more energy to deform memory foam repeatedly, which is why it's so good for cushioning things: unlike simple sponge foam, it absorbs energy when you deform it but doesn't give all that energy back again when it relaxes. What sorts of materials are viscoelastic? If all this makes you think viscoelasticity is some sort of weird scientific invention that doesn't exist outside laboratories, you'd be wrong. All sorts of everyday materials are viscoelastic to a greater or lesser extent, from obvious things like leather to much more surprising examples such as concrete, wood, and stone. Body tissue is also viscoelastic. Poke a finger into your stomach, your thigh, or even the skinny cheek of your open mouth and you'll see it takes time to return to its previous shape. Now obviously we can't make things like bed mattresses from people's stomachs, so we have to use synthetic materials instead, namely plastics. Viscoelastic foams are made from foam containing about 15–75 percent polyether polyol and isocyanate compounds (much less than 15 percent and the foam doesn't show significant viscoelasticity). Typical viscoelastic memory foams include Softcel VE-1100 from Covestro (formerly Bayer MaterialScience). Why does memory foam get softer as it gets hotter? 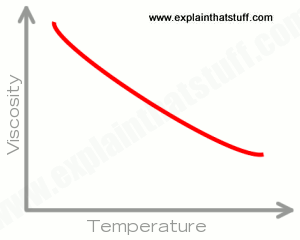 Chart: The viscosity of memory foam decreases with temperature. In other words, memory foam moves more quickly as it gets hotter. In practice, that means a memory foam mattress tends to feel softer and less stiff after you've been lying on it for a time. Most of us know that if you heat up a viscous liquid—like treacle—it becomes much more runny (less viscous). So it comes as no great surprise to find that the viscosity of memory foam also depends on its temperature. The hotter it gets, the less viscous (more flexible and "runny") it becomes. In the case of VE-1100, its viscosity at warm, room temperature (20°C or 68°F) is about 280 cSt (centistokes); at body temperature (~37°C or 98.6°F), its viscosity falls to something like 150 cSt. In other words, memory foam becomes significantly more flexible as it gets hotter—which is why you might find a memory foam mattress becomes much more squishy after you've been lying on it for a few hours. Increased humidity has a similar effect. One of the problems with ordinary memory foam is that it isn't breathable: the foam isn't ventilated in any way, so it can't dissipate heat or moisture. That can be a real problem with a mattress, because you're necessarily going to be sleeping on it for about 8 hours at a time. Some memory foams are made from what's called reticulated foam; instead of just solid foam, they have a more open-celled structure that promotes ventilation and allows moisture to flow away from your body. Is memory foam more hygienic? High-density foam mattresses are also claimed to be more hygienic because bed bugs apparently don't like living in the foam. In reality, bugs can lurk in your bedding, on your carpet, on your walls, and in plenty of other places in your bedroom—so this claim is a bit of an exaggeration. It may be true that memory foam beds reduce the problem of bed bugs, but scrupulous hygiene is really the only solution to that particular problem, not just a change in your mattress. Having said that, some memory foams are manufactured with antibacterial agents and deoderants added to the polymer mix, specifically to improve hygiene. 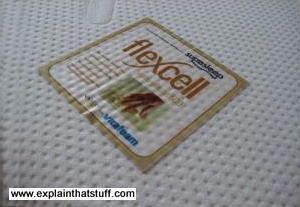 Photo: This mattress has a washable cellular cover to keep it cool and clean. Simply unzip it, throw it in the clothes washing machine, and your mattress looks as good as new. I've found that putting extra layers on top of a mattress like this can make it a little more comfortable but, at the same time, will reduce its ability to mold to my body shape. You need to experiment to find the most comfortable solution for your own body. 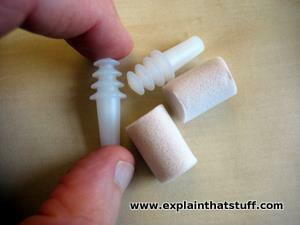 Photo: Foam earplugs ("ear defenders"), like the flesh-colored ones on the right, make a tight and effective seal because they're viscoelastic; the light-gray plastic ones on the left are simply elastic and rely on flanges to make a seal instead. Beds aren't the only things that need to be comfortable, so mattresses and pillows are far from the only uses for memory foam. I recently invested in a new set of noise-isolating headphones and found that they shipped with a whole set of earplugs, some of them made from memory foam. You squash them tightly into your ear canals and, over time, they gradually relax again, sealing themselves into your ears and blocking out unwanted ambient sounds. Better quality foam earplugs (sometimes called ear defenders) are also made from memory foam—and it's important to remember that when you're pressing them into your ears. Wait a little while (roughly 30–60 seconds) with your finger pressed loosely on the end and you'll find they slowly expand, stay in your ears, and make a much better seal than if you push them in and release your finger straight away. Why? Because they're viscoelastic—and we need to make their hysteresis (the time lag between deformation and relaxation) work to our advantage. Viscoelasticity crops up a great deal in the world of medicine. As you might expect, you can find memory foam in simple things like pressure-relieving cushions, but (much less obviously) viscoelasticity is also a feature of such things as hydrocolloidal wound-care dressings (used in blister plasters). You need to know about viscoelasticity if you're an eye surgeon (viscoelastic gels are used to protect and stabilize parts of the eye during things like cataract and glaucoma surgery), if you're a prosthetist (designer of limb "replacements"), or if you're developing artificial skin that behaves as closely as possible like the real thing—to give just three examples. It's not every day that viscoelasticity makes history, but it certainly did on the morning of January 28, 1986 when NASA launched the Challenger Space Shuttle for the final, fateful time. Fluid seals and gaskets made from rubbery materials are typically viscoelastic, which means they fit well and seal effectively. But it also means how well they fit and seal can change critically with their operating temperature. On that particular day, it was freezing cold, so the O-ring seals in the Shuttle's twin solid rocket boosters didn't flex and seal effectively. Hot, high-pressure gases escaped, the fuel tanks exploded, Challenger was destroyed, and the seven people on board were killed. An Easy Choice? Dream On: How to Find the Best Mattress in the Maze of Choices by Steven Kurutz. The New York Times. October 8, 2014. From springs to latex and memory foam, a useful comparison of the baffling variety of mattress materials available. 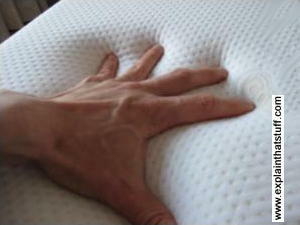 Tempur-Pedic Mattress Comparison by Brad Bartz, Space Daily. An interesting comparison of two leading viscoelastic foam mattresses. Viscoelastic Solids by Roderic S. Lakes. CRC Press, 1999 (reissued 2018). Explores the science of viscoelastic materials and their many everyday applications. Patent WO2004063088: Visco-elastic memory foam with functions of anti-bacteria, deodorization and far infrared rays emission by Jangho Choi, Jaeseok Chang, July 29, 2004. A more hygienic memory foam with various other claimed benefits. US 20050210595: Mattress having reticulated viscoelastic foam by Anthony Di Stasio et al, September 29, 2005. A memory mattress using open (reticulated) foam, claiming improved breathability and heat dissipation. US20020152554A1: Spring units by Peter Douglas Spinks and Simon Paul Spinks, Howard Spinks Beds, December 30, 2003. A typical spring design for pocket-sprung mattresses. Covestro: Softcel VE-1100: Polyether Polyol: A technical data sheet for VE-1100, a common type of viscoelastic foam. TEMPUR and TEMPUR-PEDIC are registered trademarks of Tempur World LLC, or Tempur-Pedic International, Inc.